Kathy Whitfield and Judy Mayo have been our Tuesday “Route F” drivers for many years. 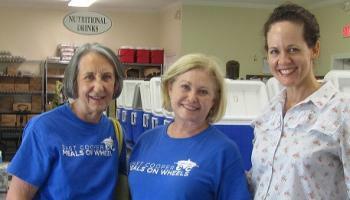 Although Kathy and Judy did not begin at East Cooper Meals on Wheels together, they were matched together, perfectly, over time. Initially, Kathy had a driving partner. Once Kathy’s partner relocated, Kathy began delivering meals on Route F, alone. Shortly after Judy moved to the area, Judy was at Bible study one day and learned of a woman, named Kathy, who was in need of a driving partner at East Cooper Meals on Wheels. Because Judy was looking for a way to become involved in her new community, she and her husband, Frank, jumped on the opportunity. Kathy and Judy have been partners ever since. In fact, Kathy and Judy became ambassadors years ago for our organization. Judy, Kathy and their significant others, Jerry and Frank, became very involved with our fundraising events, as well as substitute driving. These four friends would always attend many different events to help spread the good word about East Cooper Meals on Wheels. They were and are always willing to help. Frank passed away in January 2018, and we think of him often. Frank’s willingness to give so much of his time to us and our many recipients continues to keep us in awe. Frank is very missed by all of us. Kathy says many of the folks on Route F have become her extended family. The care given to the recipients is reciprocated. Kathy and Judy feel loved by those they take care of each Tuesday.